Some people want buildings that adapt according to climate, respond to their occupants’ changing moods, and grow, develop, evolve and transform as if living organisms. From werewolves to trucks that transform into enormous robots, the human fascination with transformation seems part of our cultural DNA. I’ll start with metaphor. Metaphor is an animal term. Meta means “change, transformation, permutation, or substitution” according to the OED. The “phor” part of the word comes from the Greek ϕορά (phorá) a form of the word ϕέρειν (phérein) meaning to carry or to bear. So a metaphor is a word that bears a change or substitution. That’s an etymology widely accepted. I even found confirmation on the Etyman Language Blog. But the animal connection to metaphor requires further elaboration. The OED relates the English verb to bear to the Greek ϕέρειν (phérein) and to words like bhar in Indo-European languages. Now consider the noun bear, i.e the large furry mammal. Well that’s άρκτος (árktos) in Greek, so there’s no etymological connection there. But here’s a passage in Paul Shepard’s book The Others: “‘Metaphor’ is from the Indo-European root bher, the same root for ‘bear’ — the bearer” (132), and Shepard does mean the bear as animal. It’s as if the bear got it’s name because it carries things — the bear as bearer. I can’t find any etymological support for such an obvious sounding connection. But there’s a strong metaphorical connection at least, in spite of Shepard’s dubious etymology. Elsewhere in the book he asserts that “the bear is the most significant animal in the history of metaphysics in the northern hemisphere” (167), and re-introduces the reader to Teddy, Pooh, Paddington, Yogi and Smokey. Most significantly, animals (bears included) provide two roles in human understanding and cognition. (i) One is to furnish us with metaphorical associations. He cites anthropologist James Fernandez, who draws attention to the propensity of parents to look to animals when addressing their “infantile inchoates”: little bear, tiger, kitten, lamb: “How often those earliest objects are animals. And how inclined we are to comb the world for cunning animals to surround our children with” (46). Animals provide ready analogues, purveying sufficient similarities and differences to ourselves in form, behaviour and temperament to serve in our metaphorical constructions: he or she is as strong as an ox, cunning as a fox, cheeky as a monkey, spritely as a gazelle, etc. (ii) Animals also furnish us, or at least our forebears, with the idea of the transformations that constitute metaphor. So bears hibernate in the winter and awake renewed. Shepard elaborates on the bear in this respect, the bear as bearer: “The mythology of the bear emphasizes its transforming and nurturing power as manifest in the hibernatory death and awakening new birth, the she-bear’s monumental caregiving, weaning, discipline, and the skirmish of young adults in making a place for themselves in the social system, all boundary phenomena, all to be given metaphoric use in myth” (132). More obvious than hibernating bears as creatures in transformation: tadpoles turn into frogs, caterpillars into butterflies, and cygnets into swans. Then there are those creatures that occupy the boundary condition of whatever category system we set up to deal with the world. So things that fly are birds, but bats also fly and have teeth rather than beaks. The natural world teaches us about exceptions and boundary crossing, illustrating Aristotle’s definition of metaphor: giving a thing a name that belongs to something else, i.e. the idea that metaphor involves misclassification. For example, to call a man or woman a bear would be to put him or her in the “wrong” category, though we readily accept it as a metaphor. So the point here is that metaphor use inevitably involves transformations, different ways of looking at something, and we use metaphors tactically in politics, diplomacy, argument, design and architecture. Not only do we draw on animals as exemplars of such transformations, but animals provide one of our primary means of learning about transformation, and even help us construct the idea of transformation. If generations of hypothetical proto-humans were transported to an inorganic world of only rocks and stones would they have developed the idea of transformation, or of metaphor? Shepard and others make much of the actual and mythical shape-shifting that goes on within the animal kingdom. That’s all highly relevant to architecture in the digital age, where organic architects look to buildings and spaces that move, change, adapt, and respond. Shape-shifting architecture plugs into some fairly primitive linguistic and mythical tendencies. See Howling at the moon. Fernandez, James W. 1972. Persuasions and performances: The beast in everybody … and the metaphors of everyman. Daedalus, (101) 1, 39-60. 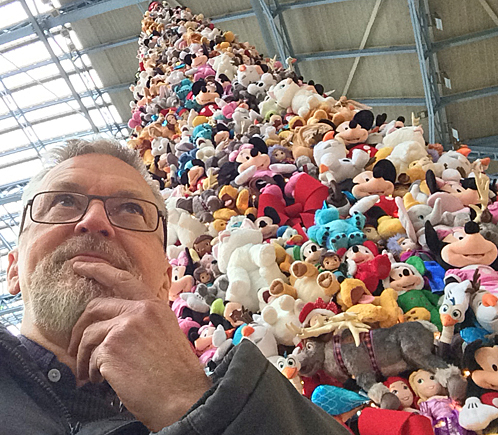 The first image is of a pile of Disney soft toys at St Pancras Station, London, at Christmas 2015, configured to resemble a Christmas tree. There are bears amongst all the mouse ears. The second image is of a workshop organised by Dorothea Kalogianni in which participants prototyped some shape shifting architectural mechanisms.